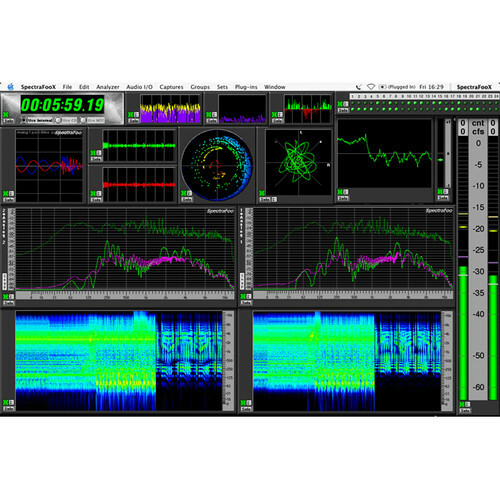 SpectraFoo Complete from Metric Halo is a stand-alone application for Mac OS X that provides all of the metering and analysis tools demanded by present day digital audio projects. The program is especially useful for the live sound engineer, those working in broadcast and the mixer or mastering engineer. SpectraFoo Complete includes standards-based level metering, high-speed, high resolution spectral analysis, Phase Torch phase meters, correlation metering, trigger-able waveform display, power balancing and a variety of power, envelope and spectral histories and phase analysis on any number of input or output channels. The package also adds tools to provide the engineer with sample code metering tools, a recording, playback, looping and static analysis system and a complete transfer function acoustic analysis system used by countless tours the world over.